CLASSIC ALBUM REVIEW - DEF LEPPARD - "HYSTERIA"
In the late 80s I picked up on Def Leppard, they and Bon Jovi were really my only favourite Rock bands (before I latched on to a couple of my brother's favourite bands Thin Lizzy and Rush). Both bands were similar, catchy Rock songs with the obligatory guitar solos and great vocals from Joe Elliott and Jon Bon Jovi. 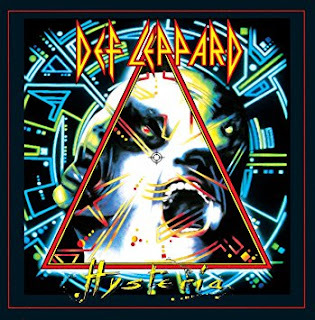 Hysteria caught my attention because it had the brilliant "Animal" on it and soon there would be seven singles spawned from this album but this one was the big hit and I had to hear more. I soon found the previous three albums and realised I remembered songs like "Hello America", "Rock Of Ages" and "Photograph" from my brother's records. Onto this album, as I said the first single from it, "Animal" was the biggest hit reaching number 6 and rightly so, it set the pace for the album theme perfectly. It had the almost Pop Rock backing similar to Whitesnake at the time, an extremely catchy harmonised echoed chorus, perfect for radio airplay. "Hysteria" the second single only peaked at number 26, surprising as it reminded me of Fleetwood Mac or The Cars, two popular 80s bands of the time. A nice ballad, mabe after the much rockier first single fans weren't expecting this. Another great favourite of mine, "Pour Some Sugar On Me" followed reaching number 18, this was in similar form to "Animal", harmonised powerful vocals, with a simple catchy chorus that everyone could sing along with. These are the songs that epitomise Def Leppard. The early Bryan Adams sound could be heard on the ballad "Love Bites", which came before "Armageddon It", an Aerosmith Pop Rock crossover. "Rocket" was the final single two years later which kind of summed up the whole "Hysteria" album with the guitar solos, simple chorus, chanted and harmonised lyrics and crashing drums. No filler all killer album? "Women" the opening track of the album is actually not my favourite track here, apart from the big chorus and hints of a guitar solo this isn't that memorable, but this album's standard is high so maybe it just has a high bar to reach. "Gods Of War" in my opinion should have been a single, it is over 6 minutes long but a great member of the "Animal"/"Pour Some Sugar On Me" club, typical Def Leppard, all the elements are here for Rock radio. "Dont Shoot Shotgun" is a Classic Rock throwback to the band's previous albums, with a similar sound to "Photograph". "Run Riot" is a speedy foot stomper in the guise of an Iron Maiden/Kiss hybrid. Great track. "Excitable" also reminds me a little of Aerosmith, more electronically composed than the rest of the album , with spoken, vocoded and echoed vocals for effect. "Love And Affection" is another retro hint to the band's early days with a Classic Rock ballad. A nice raw look back to finish the album, before Robert John "Mutt" Lange took over production duties. NEW MUSIC PROFILE - POP ARTIST "JESSICA BOSWELL"
CLASSIC ALBUM REVIEW - THE CULT - "LOVE"
CLASSIC ALBUM REVIEW - WHAM! - "MAKE IT BIG"